Spent yesterday out at Camp Casey. 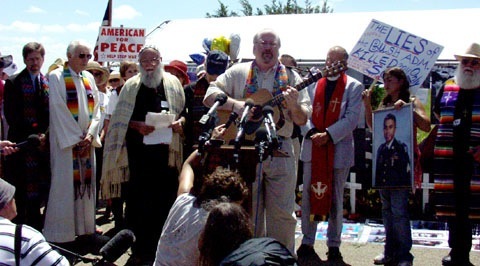 I had been asked to provide music for an interfaith prayer vigil to take place at noon-time. Here’s a great photo collage from Jeff Paterson and “Not in Our Name” of the prayer vigil. Jeff has also produced an incredible video, with my song as the soundtrack. Spent several days this week, fretting over what music to play, and finally decided on some very simple songs. (I”ll talk about those in a minute…) The over-riding news of the day, of course, was the departure from Camp Casey of Cindy Sheehan herself. The news was so fresh that no one really knew what we’d find there at camp when we arrived…would the movement be continuing? Would it fall apart? Far from it. Actually, when I compare my trip Monday and my trip Friday, there were probably DOUBLE the number of folks out at the Camp and in at the Crawford Peace House on Friday, after Cindy had left. (And, as I was leaving yesterday, more and more were still pouring in…) So, clearly, the movement is not waning, even with Cindy not there. The clergy gathered at the Peace House about ten thirty, and went over our brief order of service. Then, we loaded in vans and went out to the site. It was great to meet Barbara R, from Austin, who was our van driver and an incredibly wonderful person. She and another guy (whose name escapes me…) seemed to mostly be putting things together. The Gold Star Families,Iraq Veterans Groups,Military Families Speak Out, were holding a ten-thirty press conference, and as soon as it was over, our vigil started. You can hear some of that press conference here. 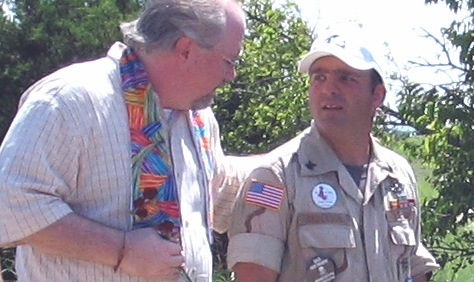 The clergy gathered at the end of the row of crosses, and processed down toward Camp Casey. The family members, who were finishing their press conference, met us halfway, and we embraced and headed back to the camp. I must say, this was the most moving, but also the most annoying, part of the prayer vigil. It was moving, because we got to meet these family members of those who had died in Iraq, and the Iraq War Veterans who are joining them in support. It was annoying, because the media was crowding in, snapping pictures, and almost leering at us. I’ve been around the media now and then, but I’ve never found them to be that intrusive before. Even the Sheriff started speaking to them, challenging them to get off the road. When we got the site, I opened the service with two songs: “The Gift of Love” (caution: cheezy midi sound at this link…) and a song I’d written for the occasion, called “God is Here With Us.” After this, there was a time of prayer from several clergy of many different denominations, a time for the “prayers of the people,” and finally a time when the families and Vets gathered in the midst of us, and we prayed for them by laying hands on them in prayer. At the very end, I played my new song, “Prairie Chapel Road. After we were finished, it was incredibly gratifying to have several of the family members come up to me and tell me how much they appreciated the song. People kept telling me over and over that they hoped everyone could hear the song, and that it captured the feeling of Camp Casey really well. It’s not often, as a songwriter, that you encounter people THAT grateful for what you’ve written, so it was humbling and gratifying all at the same time. Among the wonderful military families I met who were grateful for the song, were Mimi Evans, and Becky Lourey (sp?) who is a Minnesota State Senator. They did a marvelous job at their press conference, making it clear that they are keeping the questions Cindy originally asked open. I spent a lot of time with Charlie Anderson, an Iraq War Vet who served around Basra and “south of Bagdad.” Won’t go into all of what we talked about, but it was a powerful and moving conversation. (Quicktime of Charlie reading a letter. After this, we escorted the families members and vets to the doorstep of Bush’s ranch, as they attempted to deliver a letter to him. However, a Secret Service agent was there at the gate and said that no one was there who could officially accept the letter. So, the families left the letter in the middle of the road, along with one of the flowers we’d given them. Afterwards, we went back to the Peace House for lunch and more visiting with the families/vets. I am very grateful for this chance to listen to the stories of these mothers and veterans, and to support them and their right to speak out for peace. I’m amazed at their courage and their ability to stay focused, in the midst of all sorts of craziness. They don’t ALL agree…they don’t all see the “solution” eye-to-eye. But they are united in their desire for a swift and lasting peace.